To setup new Warehouses/Suppliers, begin by providing the list to Logicbroker. A list of onboarding partners will be provided in our project management solution. Additionally, any account numbers (Vendor Duns) or telephone numbers will be helpful. Begin by contacting the supplier and providing a implementation package, includes a survey and links to all documentation to begin integrating. indicates connectivity is being tested and setup for their integration. indicates testing has begun and the supplier is following test cases. Testing complete and ready for retailer sign off. Retailer approval is granted and date/time for all parties will get coordinated. Onboarding has been put on hold, details will be in task. 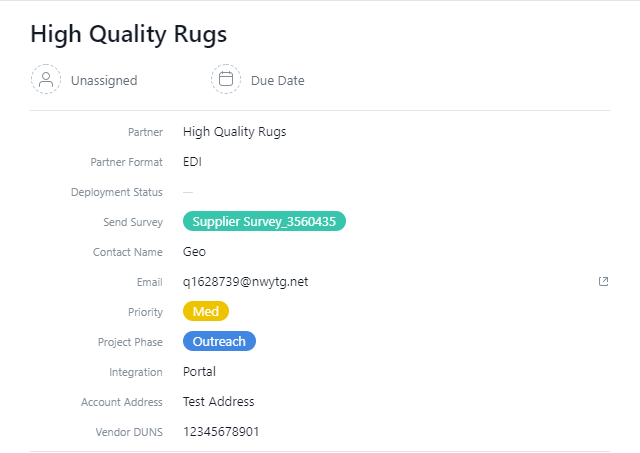 This is just a starting template and a custom program to managing your supplier outreach can be altered to fit your business requirements. Logicbroker must maintain and manage the connectivity of all suppliers. 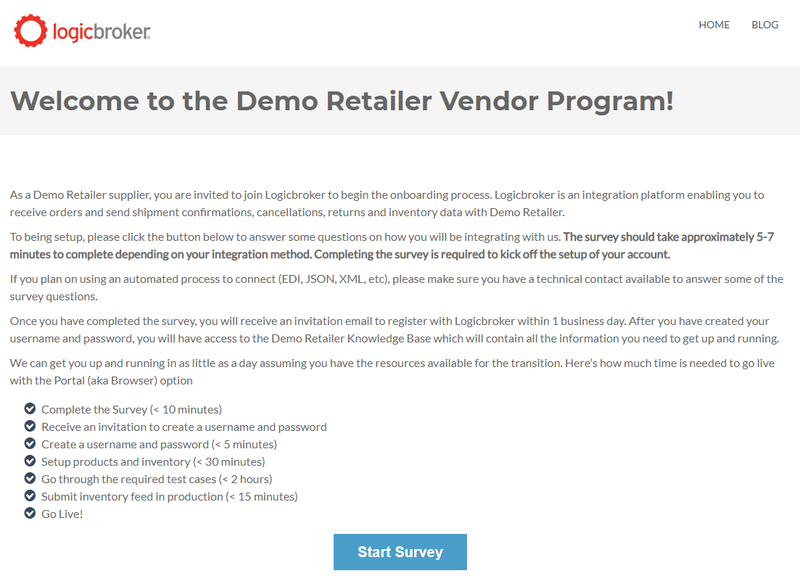 This is to ensure that if they have an existing integration with Logicbroker they are easily and quickly connected. When contacting suppliers, all contacts are entered in a communication workflow system and tracked with status updates under their task. These are tracked by tags which are automatically updated based on the status. triggers the sending of the integration package. Indicates email was sent successfully. 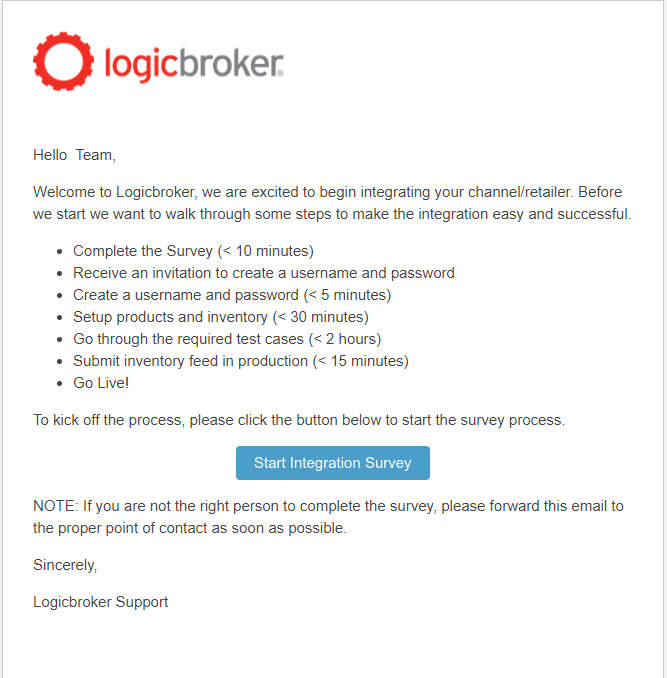 Logicbroker has an automated follow-up system, that will automatically remind users to finish their implementation process. This can be scheduled at any time after a user is initially contacted. Indicates that a survey is submitted and the task will be updated with all response data, used to expedite the implementation process. Indicates the user has reviewed the email and viewed the integration package. Indicates the email attempted to send, but bounced. 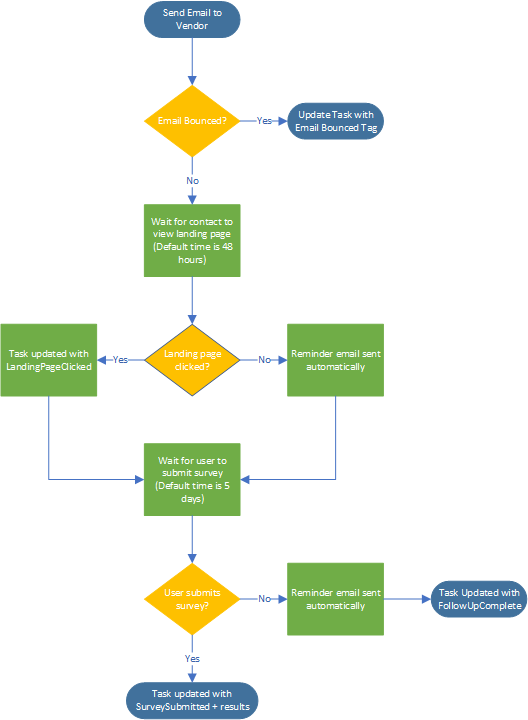 Based on your process, the communication workflow can be customized for full automation or include a more hands on approach. All emails, landing page, knowledge base and survey content can be customized as well and will be reviewed before the onboarding plan is put into place. Samples of the standard communications and overview are shown below. Our standard onboarding and testing plan will follow the steps posted in the Supplier Onboarding section. If this process required customization, a customized knowledge base can be created for you and your suppliers. Below is an example survey used to gather information from your suppliers. You can click through to review standard questions. This can be customized to fit your onboarding process.